An award-winning wireless weighing system for forklift trucks from the Netherlands, iForks has recently been certified for legal trade in Australia. The approval, obtained from the National Measurement Institute of Australia, means the system can now be used for invoicing by weight in commercial transactions in the country. The weighing system is built into a pair of fork tynes and is completely wireless, requiring no external cables and is therefore easy to install. Developed by Netherlands-based mobile weighing systems specialist RAVAS, iForks has won the FLTA Innovation Award 2010 in the UK. Due to the compact design of the scale forks, RAVAS says lifting capacity and visibility of the lifting device will not be affected with the iForks installed. According to RAVAS, the certification not only guarantees the accuracy of the weighing system but it also acknowledges that the weighing accuracy is independent from the location of the load centre of the forks, as well as the fact that iForks is not influenced by temperature changes and electromagnetic emissions where the system is operating in. The Legal for Trade version of the iForks is equipped with a digital level correction sensor which measures the tilt of the lift truck mast. It feeds this information to the software in the scale indicator, which correct the weight for the tilt influences. 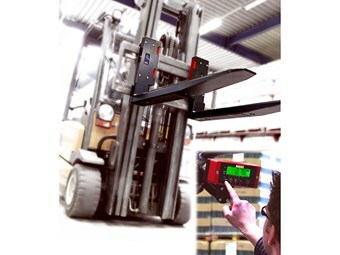 This means forklift operators no longer need to put the mast in vertical position to obtain accurate weighing. The iForks weight indicator also has an alibi memory, which means the system stores all weight data of items it measured. The memory also allows wireless data communication between iForks and a Warehouse Management System (WMS) or Enterprise Resource Planning (ERP) system to allow invoicing by weight. The iForks wireless weighing system is distributed in Australia by VIC-based Specialised Weighing Solutions Pty Ltd.